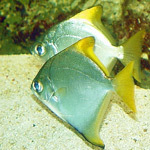 Peaceful lively schooling fish from the brackish areas around the Indian Ocean. Sometimes he lives in sweet water but they always return quickly to brackish water. It is not wise to keep them in sweet water all the time. The aquarium should be set up with coral sand and plants from brackwater areas. Stones and roots can be used as well. They need a lot of free swimming space. They are omnivorous. You should give them a great variety of live, frozen and dry food. Small fishes are eaten as well. A part of the food should be vegetable. Monos. are compatible with most other brackish water fish such as Archers, Scats, Puffers, Fan Dancer Gobies, and White Tip Shark Cats.